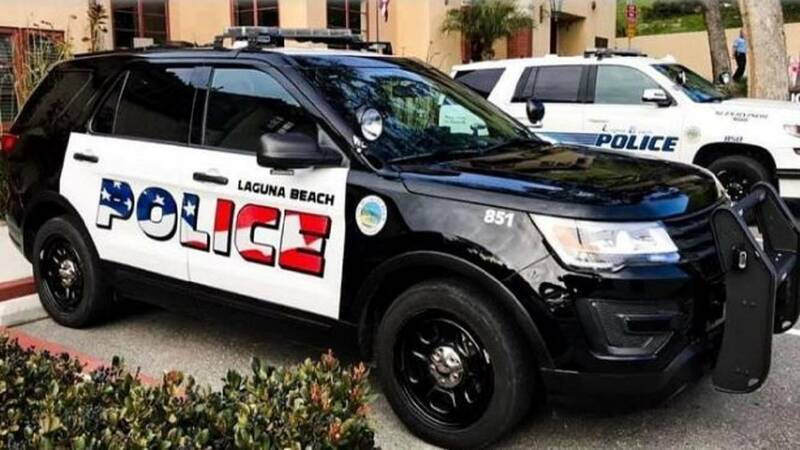 LAGUNA BEACH, Calif. - An American flag graphic on the side of freshly painted police cars is dividing a small coastal city in Southern California. Some people in Laguna Beach feel the flag design is too aggressive while others are astonished that anyone would object to the American flag, The Los Angeles Times reported Saturday. The city council will decide at its Tuesday meeting whether to keep the logo or choose an alternative. Artist Carrie Woodburn said at a March council meeting that it was "shocking to see the boldness of the design" when the newly painted Ford Explorers rolled out. "We have such an amazing community of artists here, and I thought the aesthetic didn't really represent our community," Woodburn said. "It feels very aggressive." But attorney Jennifer Welsh Zeiter said that she found the police cars "exceptional" and questioned the loyalty of anyone who objected to the American flag display. Critics are so blinded by their hatred of President Donald Trump, she said, "that they cannot see through their current biases to realize that a police vehicle with the American flag is the ultimate American expression." The city council agreed in February to repaint its all-white squad cars in black and white with the stars and stripes running through the word "police" on the doors. The police department has 11 squad cars. The proposed graphic that the council unanimously approved in February was a more muted version of the design that now appears on the cars. Laguna Beach has about 23,000 people and is 55 miles south of Los Angeles.